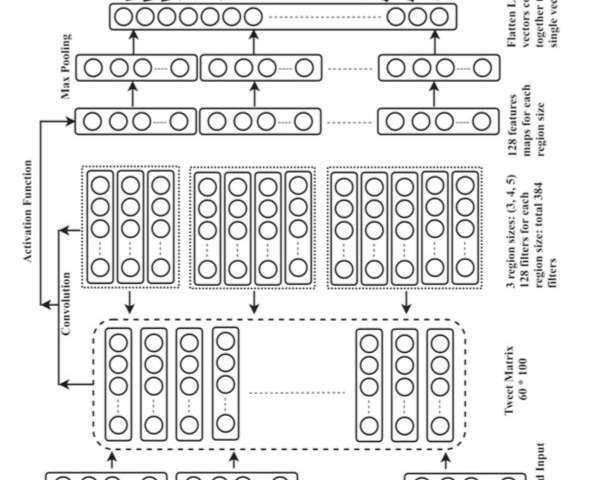 Overall architecture for the Convolutional Neural Network (CNN). Credit: Singh and Kumar. Researchers at the National Institute of Technology Patna, in India, have recently devised a tool to identify the geographical location of emergencies and disasters, as well as that of the people involved in them. Their approach, outlined in a paper in the International Journal of Disaster Risk Reduction, extracts location information from tweets using a convolutional neural network (CNN)-based model. "During emergencies, the geographical location information of the events, as well as that of affected users, are vitally important," Jyoti Prakash Singh, one of the researchers that carried out the study, told TechXplore. "Identifying this geographic location is a challenging task, as available location fields such as user location and place name of tweets are not reliable. The precise GPS location of users is rare in tweets, and also sometimes incorrect in terms of spatiotemporal information." People affected by natural disasters or other emergencies often share their location on social media, asking for help. This information could help response units and local authorities to detect events early, locate victims and assist them. However, extracting location-related data from tweets is a very challenging task, as these are often written in non-standard English and contain grammatical errors, spelling mistakes or abbreviations. "It is almost impossible for human operators tracking tweets to go through each tweet and find the location information mentioned in them," Singh said. "This motivated us to develop a solution to automatically extract location information from tweets asking for help. In this work, we utilized deep learning to determine whether a tweet contains location names and highlight these words." Singh and his colleague Abhivan Kumar developed a CNN model that can identify the location of users by analyzing the content of their tweets. They chose this specific deep learning approach because it can automatically learn the best representation of input data and use this to identify location references. "We used a word-embedding technique to represent tweets at the input layer of the CNN and location references present in the tweet are represented in the output layer in the form of a zero-one vector," Singh explained. "The location words are encoded as 1 and the non-location words are encoded as 0. We used several combinations of 2-gram, 3-gram, 4-gram, and 5-gram filters to extract features from the tweet. After training for the model for the 100 epochs, it is able to predict the location references mentioned in the tweet with impressive accuracy." In an initial evaluation, the CNN model devised by Singh and Kumar was able to extract all location-related words from tweets with very high accuracy, even when the text of a tweet was noisy. The researchers tested their model on tweets that had not been pre-processed and contained grammatical errors, typos, abbreviations, and other confounding factors. "The main practical implication of our work is that it can be easily pipelined, using event detection models," Singh said. "Event detection models can identify tweets that are related to the said disaster and our model can extract the location of the victims affected by that disaster." In the future, the CNN model developed by the researchers could help to quickly locate emergency events and people who require urgent assistance. The same approach could also be applied to civil unrest, targeted advertising, observing regional human behavior, real-time road traffic management and other location-based services. "In this work we only considered English language tweets, but during a crisis users also post tweets in their regional languages," Singh said. "We are hence working on a model that addresses this multi-lingual limitation, while also trying to develop a semi-supervised model to reduce the issue of data labelling."